Trying to find a solid set of double kickers for a good price? The Yamaha Flying Dragon series may be what you are looking for. With a solid background, Yamaha easily holds up with the competition, bringing speed, style, and affordability to the table. But are the pedals worth the time and money? 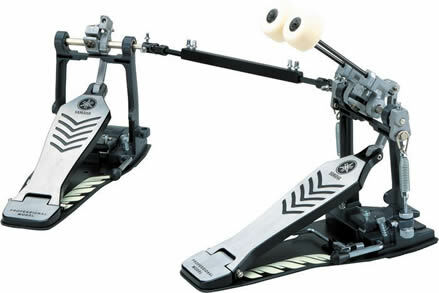 Or has The Yamaha Drum Company missed the mark with their version of the double bass pedal. Right away you will notice the stylish design of these pedals. The pedal itself’ comes with a blue cover that you may remove, or leave on for visual sakes. On the base of both pedals, you will notice a design on either side of the pedal. These fluorescent stripes may look silly at first, but play these pedals in the dark and you will notice they glow! This is great for when you are playing in a darker club, and you cannot see anything behind your kit. All in all, the set looks very visually pleasing. I was very impressed when I opened up the box for these pedals. For the price I paid, I was expecting nothing more than a set of pedals. This was not the case. Along with the pedals was a soft case to carry them in, a drum key specifically designed for them, as well as a set of belts and chains so you can chose which to use. Although most Bass drum pedals come with a carrying case and key, none were this cheap. I shouldn’t forget to mention the stickers that came with it too, good old’ Yamaha stickers! So how do they play? Well, when it comes to adjustability, these are awesome. You can adjust pretty much everything you want on them. The specific drum key you get with the set, allows you to adjust everything from the pedal height, to bass drum grippers. Like any pedal, you can raise or lower the beaters, change the angle of them, and adjust the spring tensions. What I really like about these pedals is how light their beaters are. I have used others where their beaters were heavy, with a plastic tip, making it heavier and more inefficient. These however, were nice and light, offering a solid punch. I was easily able to adjust both pedals evenly to allow for a uniform feel. This is the most important part to double bass pedals. The only real issue I had with these is the movement of the left pedal. Although there is a spike that sticks into the carpet, I still found it wandered away on me. The Yamaha Flying Dragons will run you anywhere from $260 - $280 USD. This is where Yamaha separates from the competition. At a price like this, it is easy to afford a high quality set of double pedals. In comparison, a set of DW’s or Iron Cobras, will run you well over $350. For what you get with the Yamaha’s, I was very impressed. The Bass drum pedal feels like a solid pedal that will not break very easily. This, along with all the accessories makes the Flying Dragons a great bang for your buck! RTOM Moongel Workout Pad - Looking to improve your chops? Many drummers rely on the use of a practice pad to work on rudiments and hand speed when they are away from the kit. Unfortunately, most practice pads only emulate the feel of a snare drum. Rhythm Tech Tambourine - Adding this percussion peice to any drum set will definetly spice up your creativity. But there are some very awful sounding tambourines on the market. Does Rhytm Tech hit the mark?